Domino’s Pizza is a very good business. It has exploited the trend of the growth in take-away pizza superbly and now has a 46% share of the UK’s £2.1 billion pizza market. For many years it has been able to grow its sales and profits whilst producing high profit margins, high returns on capital employed (ROCE) and generating decent amounts of free cash flow. These characteristics led to its shares becoming a very handsome investment for many years. 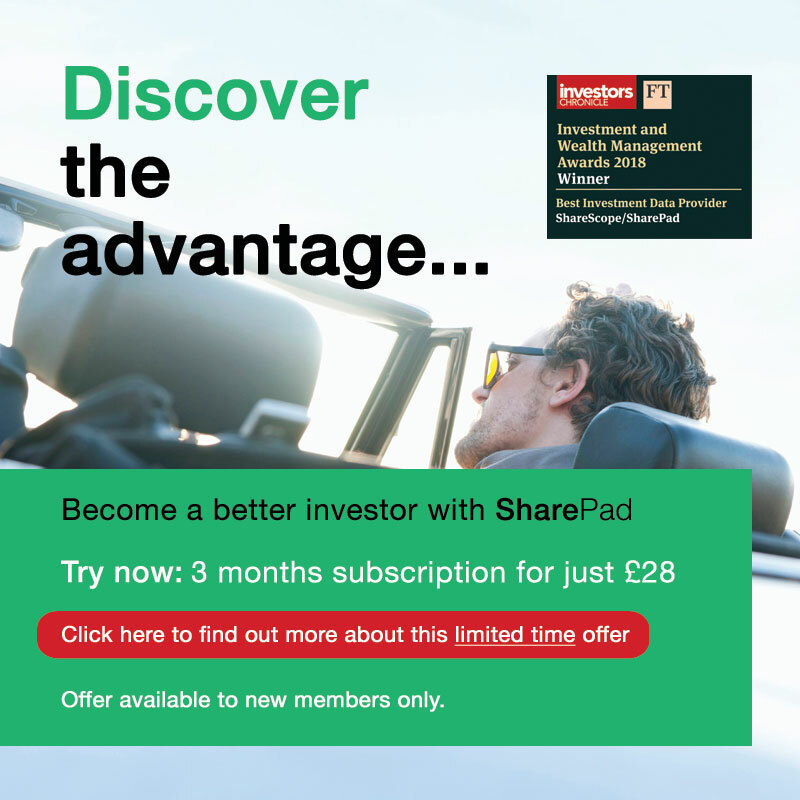 But for the last couple of years its share price has become stuck in something of a rut and has struggled to make much progress. The valuation of the shares has come down with the forward PE multiple now under 20 times having previously been nearer to 30 times. Even though profits have still been growing, the share price has refused to move meaningfully higher. The reason for the stagnation in Domino’s share price performance is because investors are questioning whether the good times are over. One of the main concerns is to do with the strategy in the UK of opening new stores in existing territories where there is already a Domino’s Pizza store or stores – referred to as splitting territories. Investors have good reasons to be concerned about this splitting strategy. Whilst opening up new stores can lead to higher overall sales for a business it can damage the profitability of individual stores if the new stores take sales from the existing stores – a process known as sales cannibalization. Sales cannibalization can wreak havoc with a retail or restaurant business. Tesco (LSE:TSCO) and Restaurant Group (LSE:RTN) are good examples of this when they opened up too many new stores next to or near existing ones. Domino’s has to convince investors that splitting territories is a good thing to do. So far the jury seems to be out. That said, one of the biggest mistakes you can make as an investor is to assume that a company’s strategy will fail just because similar strategies have failed other companies in the past. If you can, you should try to put to one side any preconceived ideas you might have and base your reasoning on hard facts. One of the most important things you can do is to understand a company’s business model and how it makes money. Instead of using your gut feeling to come to an ill-informed opinion, you might just find that there is something different about a company that means your initial worries were perhaps unfounded. In the case of Domino’s you need to try and understand how splitting territories can have different implications for the franchisor – Domino’s UK – and its franchisees. It needs to work for both parties for Domino’s to be able to keep on growing its sales and profits in the UK. In this article, I am going to try and work out what effect splitting territories has had on Domino’s core UK business and whether people like me have been worrying unnecessarily. I am not going to look at the potential of Domino’s overseas businesses. Before we can make a judgment on Domino’s UK strategy it won’t do any harm to understand how this business makes money. Domino’s owns the master franchises to trade under the Domino’s Pizza brand in the UK, Ireland, Switzerland, Norway, Iceland, Sweden and Germany. These master franchises are awarded by the US parent company Domino’s Pizza Inc (NYSE:DPZ). Net royalties – Franchisees pay 5.5% of their sales in royalties to Domino’s UK. Domino’s UK then pays 2.7% of the system sales (the sales of pizzas from all its franchised and corporate stores) to Domino’s Pizza Inc as a fee for the master franchise. Net royalties are therefore 2.8% of system sales. Supply chain sales – the sale of pizza dough, other pizza ingredients (such as cheese and toppings) and equipment to franchisees. This is by far Domino’s biggest source of profits. Rents – Domino’s has the lease contracts on all the rented stores in the UK. These are then sub-let to franchisees at cost. Rents are a pass through and are not a source of profits. Sales and profits from corporate stores. This is not a large amount of money. Franchisees also pay 4% of their sales into Domino’s national advertising fund (NAF) but this is not classified as revenue as it is operated on a breakeven basis. The cash flows are treated as working capital with the difference between monies received from franchisees and the amount spent shown on the balance sheet as a debtor or creditor and the annual change as a cash flow in the cash flow statement. The numbers here are not very big. Firstly, the profit margin as a percentage of system sales has been very consistent at around 8.6% for the last few years. This means that there has been a fairly stable relationship between the value of food its franchisees sell and the amount of profit ultimately made by Domino’s. The profit margin as a percentage of revenue is much higher at 23.7%. Secondly, sales of dough and ingredients is by far the biggest source of revenue and profits. It accounted for more than three quarters of total revenue in 2017 and is extremely profitable with a profit margin of close to 30%. Thirdly, Domino’s is a relatively low fixed cost business. Net overheads and depreciation are just 7% of revenues. Most of its costs – the cost of ingredients – are variable and dependent on the level of pizza sales by its franchisees. This means that there is not a huge amount of apparent operational gearing in the business where changes in revenues can lead to much bigger changes in profits. This may be just a coincidence but the net royalty income – franchisee royalties received less the franchise fee paid to DP Inc – pretty much covers Domino’s net overhead and depreciation costs. This means that the supply chain margin or profit is not far off the total amount of operating profit for the business as a whole. So what’s significant about this? Well, Domino’s does not have any control over how much money it makes from its franchisees in terms of royalties (which are fixed) or rents but does have some flexibility on what it charges for supplying dough and ingredients to them. I think this is important. The ultimate health and profitability of Domino’s UK depends on the health and profitability of its franchisees. If franchisees cannot make a decent return on their investment (around £300k for a store in the UK) or feel that their profits are being squeezed then it becomes much harder to convince them to open up new stores to help Domino’s grow. A key factor for the profitability of both parties is therefore the cost of ingredients and the amount of pizza sold. Domino’s says that it targets a cash margin on its cheese sales rather than an absolute percentage and sees this as a key way of helping its franchisees to make good profits. When cheese costs are falling, Domino’s tends to have a higher profit margin. When they are rising the margin tends to go down as it does not usually pass on the full amount of cost increases onto its franchisees. Up until 2016, ingredients cost inflation was pretty benign which allowed Domino’s to achieve higher profit margins on its supply chain sales and higher profit margins on revenues overall. With rising amounts of like-for-like sales growth its profits and those of its franchisees increased significantly. 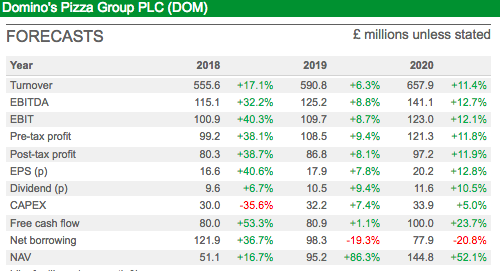 Take these figures with a bit of a pinch of salt as I’ve had to dig around as the company hasn’t been clear on average franchisee profit numbers in its communications with investors every year. 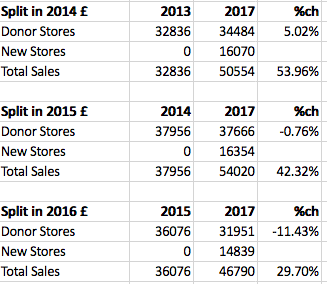 However, from what I can see, the average profitability per mature store (open for more than two years) has from an EBITDA basis (not my preferred measure but the one disclosed by the company) increased from just over £100k in 2012 to over £150k in 2017. Put in the context of a total cost of setting up a franchise store of £300k then mature stores are very profitable. Domino’s says that the cash payback period is around three years which is very attractive in anyone’s book. When franchisees are earning profits like this it’s not difficult to see how they might be encouraged to invest in more stores. 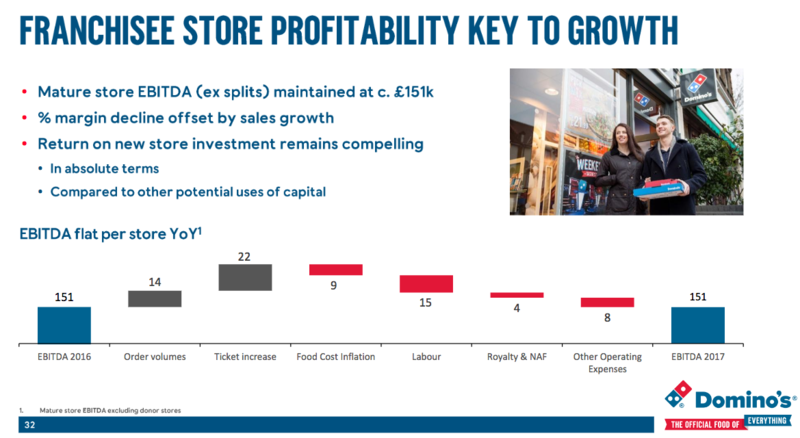 Despite the strong growth in sales, franchisee average mature store profitability was flat in 2017 mainly due to higher labour costs and food cost inflation as shown in the slide below. But this stable profit excluded the impact on profits in split territories. If splits significantly damage the profitability of the franchisee then Domino’s plan to expand its store portfolio to 1600 outlets might become more difficult. More on this later. Domino’s profits have also taken a hit from rising ingredients costs as they were not fully passed on to franchisees. This cost the company nearly a full percentage point in profit margin in 2017. 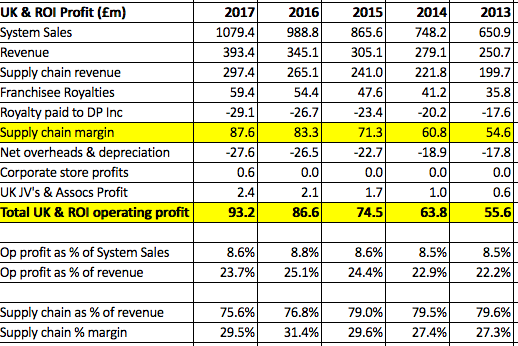 You can see below that, despite a very strong improvement in system sales, and a higher amount of incremental revenue than 2016, the extra profits generated from this growth were almost halved in 2017. With ingredients costs expected to increase by 3-4% again in 2018, Domino’s faces a difficult decision in how much of these increases to pass on. If it does not pass them on in full then its profit margin on ingredients may fall again which could mean that overall profits grow slower than revenues and margins fall again. Domino’s is helping franchisees to become more efficient to offset cost pressures. GPS tracking of delivery drivers are aimed at lowering costs. Investment in lower prices and promotions is aimed at helping stores sell more pizzas and therefore make high levels of gross profits to cope with higher costs. Domino’s and its franchisees are very profitable. Profits from selling ingredients are by far the biggest source of profits for Domino’s and the main influence on profit margins from year to year. The fixed cost base of Domino’s is very low. Average franchisee profit (excluding the effect of split territories) has stopped growing. Growth in system sales is the key to future profits growth. This is largely dependent on more stores being opened. Do split territories hurt Domino’s profits? If splitting territories increases the overall level of system sales in a territory from more pizzas being sold then other things being equal (such as ingredients costs) Domino’s profits should increase. This will come from a 2.8% net royalty on the extra sales and a profit margin on selling extra ingredients. 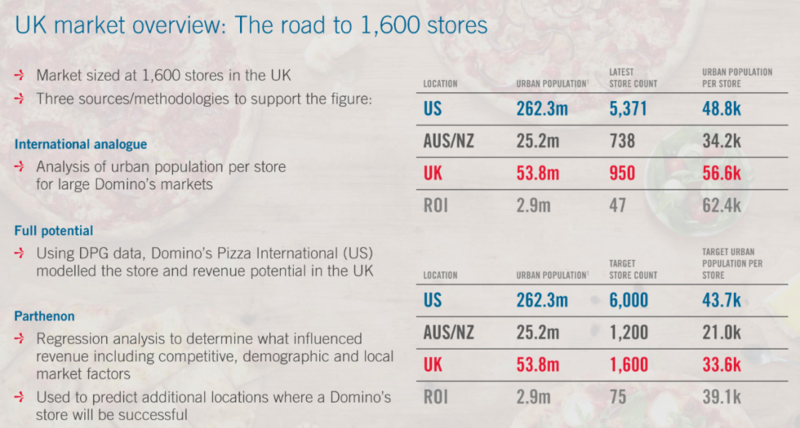 Domino’s reckons that based on the experience of the Domino’s brand elsewhere in the world, 1600 stores in the UK would not be out of kilter with places such as Australia on an urban population per store basis. The first thing to understand is that Domino’s may not be adopting this strategy by choice. The number of stores in a country are included in the terms of the master franchise agreement with Domino’s Pizza Inc. It may be demanding that Domino’s UK aggressively roll out the number of stores to get to its target of 1600. Three years ago, the target was 1200. Domino’s started splitting stores in 2014. 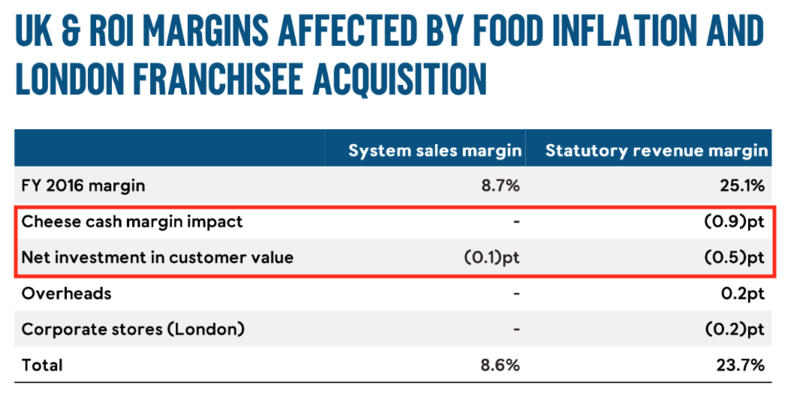 The impact they have had on Domino’s system sales is shown in the table below. The company has only given the effect of splits for the last two years. What we can see is that the extra sales from existing mature stores slowed significantly in 2017 after three years of very strong growth. Since 2016, new and immature stores have contributed £117.7m of extra sales whilst £39.7m of sales has been lost from splitting stores – a net gain of £78m. From a net royalty and supply chain margin point of view that’s going to increase profits but as shown above not necessarily by large amounts. However, there can be no doubt that system sales growth slowed in 2017 – due to slowing LFL sales – and that splits did create some drag. It is not unreasonable to see why there is some concern about the effect of splits, particularly if like-for-like sales fall. However, I feel that those fears may be overplayed if current trading is anything to go by. For the first eight weeks of 2018, UK system sales had increased by 10.9% with like-for-like sales (presumably excluding splits) growing by 7.1%. This suggests that the company is doing very well and that splits are not having a very damaging effect as yet. It also suggests that the investment in lower prices is also continuing to pay off. A fact that may also have been ignored is the positive impact that maturing stores are having on system sales. With 176 new stores opened during the last two years Domino’s still stands to benefit from significant maturation effects from them in 2018. Most of these will not be included in LFL sales figures but are a positive development that adds to system sales – and the net royalties and supply chain profits that come from them – and which needs to be taken into account. What do splits mean for the finances of franchisees? It will increase market share in a territory which will deter competition. More locations with good car parking next to convenience stores. This will improve the number of orders collected which are more profitable to the franchisee as there are no delivery costs. Lower labour and local marketing costs as the number of addresses in the territory will fall. But will franchisees buy into the strategy? It’s worth noting that Domino’s franchisees have some degree of power. A few years ago there were more than 100 franchisees but in 2016 this number had declined to 77. This means that more stores are concentrated in the hands of fewer franchisees. This risk was shown to have increased in 2017 according to the company. Will some of these franchisees refuse to open up more stores if it reduces the profits of their existing stores? Domino’s has tried to allay these fears by showing the effects splits have had on average weekly sales of existing stores in split territories. The company has given evidence of what has happened to the average weekly sales in territories that were split in 2014, 2015 and 2016. The clear benefit for Domino’s as mentioned above is that territory sales increased. The outcome for franchisees is less clear cut in my opinion. 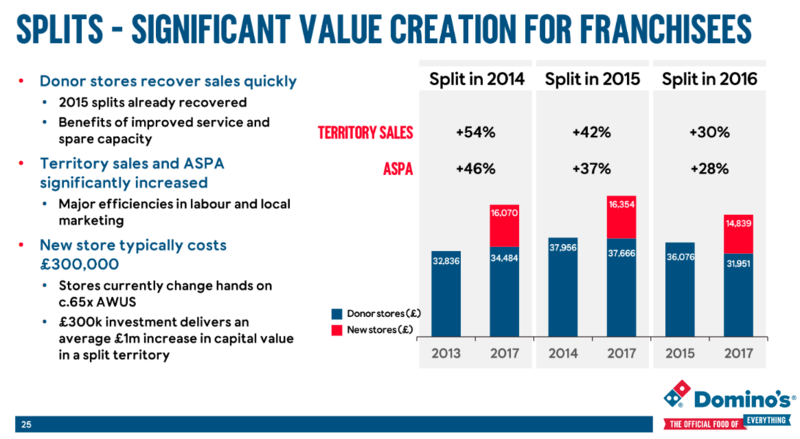 Looking at the splits done in 2014 and 2015 it would seem that there is nothing to worry about as the existing donor stores have recovered or increased their sales based on the year before the split within three or four years. The splits in 2016 have been less successful so far with sales in the donor stores still down 11% after around two years after the split. In its analyst presentation the company made an argument that the additional weekly sales in the territory created additional capital value for franchisees because franchised stores are sold for an average of 65 times average weekly sales. This means that £15,000 of extra weekly sales would be valued at £975,000 compared with the £300,000 cost of a store. This seems to be its key selling point in persuading franchisees to open more stores in their territories. What the slide above is not telling us is how many stores were in each territory before the split. If average sales per store are taken into account for the year of the split then my guess is that the weekly sales approximate to two existing stores with one new store being added. For example, in 2013 sales per average store per week were around £15.5k. That would match up to two donor stores based on the average weekly store sales of £32,286 shown above. This means that the new stores in the territory are not contributing as much in weekly sales as the existing donor stores but they are not too far away. This might mean they are less profitable and worth slightly less than 65 times weekly sales but could still be seen as attractive from a franchisee’s point of view. My concern is that the most recent splits show a significant sales reduction to the existing stores. It also remains to be seen if existing franchisees will be enthusiastic about more splits. Domino’s is 555 stores short of its 1600 target. If two thirds of these are to come from splitting territories then that means that 370 new stores have to be opened up in existing territories. This to me is the key risk to Domino’s strategy but not one that has surfaced yet. Whilst I still have some doubts, I do feel more reassured that the threat to Domino’s profitability from splitting territories is not as bad as my initial gut feeling. Domino’s business model is not the same as Tesco’s or Restaurant Group’s and the risks from sales cannibalisation are nowhere near as big in my opinion. 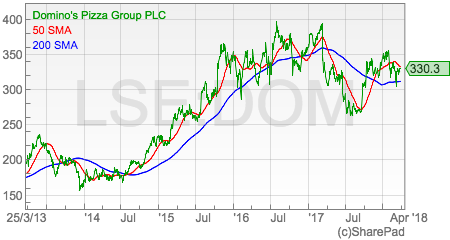 If franchisees can be persuaded to buy into this strategy and the economics stack up from a store profitability point of view then Domino’s shares may look better value than they seem at a share price of 329p and a one year forecast rolling PE of 19.5 times. One extra caveat is that the overseas business also needs to start contributing some meaningful profits.